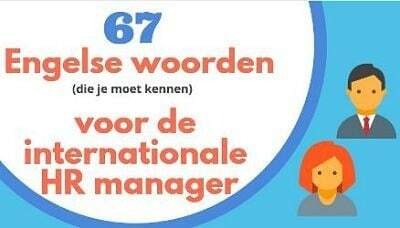 67 Engelse woorden die u als internationaal HR manager moet kennen. Als HR manager of HR medewerker in een internationaal bedrijf heb je een extra uitdaging. HR taken zijn al veel omvattend maar daarbij moet u ook regelmatig in het Engels communiceren. Dat kan zowel schriftelijk- als mondeling zijn. We schreven al eerder een artikel over ‘Engels voor de Human resource Manager. Vacancy: Als er een ‘vacancy’ is dan is er een functie beschikbaar doordat iemand is vertrokken. We don’t have any vacancies at the moment but we will keep your CV on file. Apply for a job: ‘If you ‘apply for a job’, dan stuur je jouw motivatiebrief en cv op naar de werkgever die een baan beschikbaar heeft. Twenty people have applied for the job just from advertising it on Linkedin. Letters of application: Dit zijn alle documenten die je opstuurt als je op een baan solliciteert. We have received letters of application from a wide range of candidates. The number of applicants is very high. There are a lot of people with the right qualifications and experience. Job description: Een omschrijving van alle taken, verantwoordelijkheden en competenties voor de baan. We have written new job descriptions for all the jobs in our department. Salary and benefits: Salaris en emolumenten, secondaire arbeidsvoorwaarden. We pay very competitive salaries and provide some of the best benefits in the sector. She is still on her probation period. We have another four weeks to make a final decision. To make redundant/ to lay off: Make somebody redundant. De werkrelatie/baan wordt beëindigd om economische redenen. They are closing down the factory and making 300 people redundant. Hand in (or give in) your notice: Werknemer geeft aan dat hij zijn/haar baan opzegt. She handed in her notice this morning and is leaving at the end of the month. Gives someone notice: Werknemer laten weten dat de baan/dienstverband wordt beëindigd. We have to give her two months’ notice that we are letting her go. To sack someone: Onmiddelijk ontslag, vaak om dringende redenen. I hear they intend to sack him because of his bullying. The redundant workers were given 26 weeks’ severance pay. Dismiss me and I’ll take you to court for unfair dismissal. I’ve done nothing to deserve this. Resign from a job: Jouw baan opzeggen. He resigned from his post because he couldn’t stand the long hours. Overtime: Extra uren die gewerkt worden buiten de contracturen. Flextime: een systeem waarbij werknemers i.o.m. werkgever flexibele uren bepalen. As we work flexitime, I take the children to school and arrive at nine thirty. Part-time: Een gedeelte van de dag/ week werken. When I was a student, I had a part-time job in a bar. Take time off: Uren of dagen vrij nemen. I’d like to have some time off next month. I need to paint my house. A day off: Een vrije dag. An off day: Een baal dag. Time sheet/planning: Hierop wordt het aantal gewerkte uren van de werknemer bijgehouden. We no longer have time sheets as this is done automatically by the electronic ID badges. If a public holiday is on a Thursday, many people take the Friday off and have a long weekend. Back pay: Een vergoeding die achterstallig is en door de werkgever nog moet worden uitgekeerd. I’m still owed 3 months back pay for the overtime I did before Christmas. He has the choice of accepting a pay cut or losing his job. Pay rise: Een verhoging van de vergoeding. We are looking for a pay rise in line with inflation. Pay rate: Het bedrag per uur/maand wat je als vergoeding krijgt. The company cannot attract good quality workers because of the low pay rates. Performance-related pay: Het bedrag dat wordt betaald is afhankelijk van de kwaliteit/kwantiteit van het werk. Since we introduced performance-related pay, production has doubled. A pay scale: Loonstelsel, salarisschalen. We have eight grades on our pay scale. You will start on the bottom one. Initial salary: Het start salaris. If we want to recruit better people, we will have to offer a more competitive initial salary. He earns € 40.000 a year gross. The net salary is the gross salary minus the deductions the employer makes for contributions and tax. Deductions: alle premies en belastingen die van het bruto salaris afgaan om het netto salaris over te houden. Although my gross salary seems good, after deductions, I haven’t very much left. An absorbing job: Een interessante baan, maar een baan die erg veel tijd en aandacht opeist. My job is so absorbing that I sometimes forget to have lunch. A boring job: Een baan die niet erg uitdagend is en verveeld. Would you stay in a boring job if you were really well paid? A casual job: Een baan zonder vaste uren. The unions want us to have fewer casual jobs and more permanent employees. A challenging job: Een uitdagende en zware baan. It is a very challenging job and we need to find somebody who is tough mentally. A dead-end job’: Een baan zonder uitdaging en/of vooruitzichten. I was in a dead-end job with no hope of further progress so I left the company. An exacting job or a demanding job: Een baan met grote preciese, toewijding en aandacht. Being a surgeon is a very exacting job – you can’t afford to lose your concentration. I have a very demanding job. I don’t have much spare time. A menial job: Een baan met weinig uitdaging. I can only find menial jobs such as cleaning. A prestigious job: Een baan die aanzien geeft, respect of op een hoog niveau. Running our Amsterdam main office is the sort of prestigious job I am looking for. A secure job: Een vaste baan. There are no more secure jobs in this company. Everybody’s job is at risk. A flourishing career: Een baan/carrière waarin je bent gegroeid en die succesvol is. She has had a flourishing career as a designer of children’s clothes. A colourful career: Een uitdagende en interessante carrière. His colourful career has taken him to many exciting locations. A modest career: een bescheiden carrière met weinig hoogtepunten. He had a very modest career so far with very little in the way of achievements. A binding contract: Een contract waarin zaken vastliggen en wat niet kan worden aangepast. You can’t walk out on your binding contract just because you have received a better offer elsewhere. A renewable contract: Een contract wat voortgezet kan worden. The contract is for one year, renewable for a second year if we are satisfied with your work. A temporary contract: Een tijdelijk contract. We can give you a temporary contract for six months. A breach of contract: Wanneer een actie wordt ondernomen die de afspraken in het contract aantasten. If you refuse to work on Sunday, that is a breach of contract and we will dismiss you. Draw up a contract: Een contract maken/samenstellen. I’ll draw up a contract for you and you can sign it tomorrow. Go through a contract: het contract/ de overeenkomst goed doornemen. Make sure you go through your contract carefully before you sign it. To demote: to move someone to a lower lever in the hierarchy. She was demoted after the terrible changeover to the new accounting system. To retire: to stop working due to ill health or age. Judy suffers from ill health and has had to retire early. To restructure: to organize a business or system in a new way to make it more efficient. Currently we are restructuring our organization and dividing it into five separate departments. To enforce: to impose a rule more strictly or to make people follow a rule. For health and safety reasons, we have to enforce the no-smoking rules. To deteriorate: to become worse. Sales figures have continued to deteriorate despite the launch of new products. To phase in: to introduce something in stages over a period of time. The new organization will be phased in gradually starting here in head office. Maternity leave: the period a mother is legally authorized to be absent from work before and after the birth of a child. Her maternity leave finishes next week but she is not coming back to work. Parental leave: the time that a parent is allowed to spend away from work to take care of their baby/child. You have to work for an employer for one year to qualify for parental leave to look after your children. Statutory sick pay: the money paid by a company to an employee who cannot work due to illness. If you are absent from work due to illness, you may be able to claim sick pay. Senior management: the top people in the company. We need to get approval for this from senior management. Ga je solliciteren als internationaal HR manager dan kun je deze 4 tips goed gebruiken. Altijd goed om je zakelijk Engels te verbeteren door je woordenschat te vergroten. Wil je met meerdere HR medewerkers een workshop volgen in jullie bedrijf? 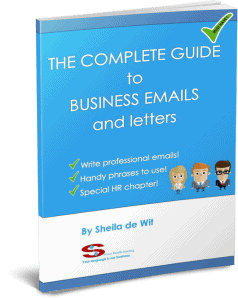 Ook hebben we een uitgebreid E-boek voor je, speciaal voor de internationale HR Manager.